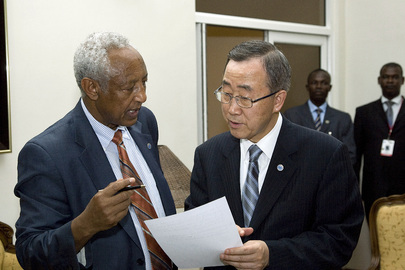 UNITED NATIONS, April 7 -- The UN "does not have the capacity actually to provide protection to anybody," the Organization's Assistant Secretary General Haile Menkerios told the Press on April 7, the 15th anniversary of the beginning of the genocide in Rwanda. He was referring to the protection provided earlier this year to the then-opposition leader in Madagascar, which he said was the responsibility of "partners on the ground" -- most say, France's embassy. Inner City Press asked about the UN's role in the coup d'etat, and why the UN Secretariat refused to call the military overthrow of an elected president a coup. Video here, from Minute 1:57. Menkerios said it is not up to the Secretary-General to designate or condemn a coup, only to opine that the change was neither constitutional nor democratic. Menkerios was noticeably well informed about a major business deal in Madagascar, South Korean firm Daewoo Logistics' lease of 1.2 million hectares of land to grow palm oil and wheat. He said that Daiwoo had "already declared it had withdrawn" from the pact before those who overthrew the president claimed credit for canceling the deal. Video here, from Minute 10:42. The question remains, did Daewoo demonstrate corporate social responsibility in cutting such a deal with a president widely viewed as monopolizing not only political but also economic power on the island? Inner City Press asked Menkerios to speak about another Africa issue discussed in the Security Council's closed door consultations on Tuesday, Eritrea - Djibouti. With a look that other reporters described as "uncomfortable" -- video here from Minute 10:27 -- Menkerios said that since he did not do the briefing on that issue, he could not discuss it. It does at least geographically fall within his portfolio. If he is disqualified, then what of Ban Ki-moon's stated "disappointment" in North Korea's rocket launch?